Superintendent Antonio G. Limón is shown at the SBCISD John F. Barron Administration Building, where he returned to work on Thursday. San Benito CISD Superintendent of Schools Antonio G. Limón is back on the job after over a year of being on paid suspension. 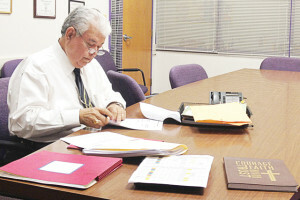 On Thursday afternoon, the San Benito News caught up with Limón as he worked through stacks of paperwork in the conference room of the John F. Barron Administration Building. Want the whole story? Pick up a copy of the June 8 edition of the San Benito News, or subscribe to our E-Edition by clicking here. I truly agree with your blog. This district is going to hell in a hand basket. I don’t understand why the board would even bring Lorenzo Sanchez into the picture. This man doesn’t know his left hand from his right foot! When will things change for the better here in San Benito? I thought these elected persons who are now running our School District would have a better mind set, and make better educated decisions. I always try to have a positive mind set when it comes to our district, but what I hear and see is people looking out for themselves. Mr. Limon and school trustees, when are you folks going to make better decisions for our kids and not yourselves? Stop, and think before you decide; stop worrying about who you’re going to upset or insult, and do what is right. If you think your going to get away with something illegal, think again for your sake and your families. Mr Limon please follow the rules of engagement regarding Documentation. Verbal conversations don’t count. Be prepared to handle the Blunders you have created in our District. Maybe it’s time for you to seek work elsewhere, maybe at Region One. You will be happy there doing nothing. Oh by the way, BOB just lost the first battle in court with the law suit he has in La Joya. And don’t try to fool us by maybe looking at Jeff, as the new agent. Those guys work as ONE. If the new insurance rates your looking for are higher than what we currently have, you can mark another notch as a big blunder to our District. Kudos to the new majority in switching clinics! Not only have they caused disruption to the district, they’ve also caused interruption in service. Whereas before, we could visit the clinic on a walk-in basis, I was uphauled at the fact that I was turned away! Going thru a transitional period?!?! ARE YOU KIDDING ME! I guess my body will just have to adjust during this ‘transitional period’. Employee health placed on the back burner. Wasn’t that bound to happen? The next thing to go is the Managed Care Plan and the clinic, we need to speak up and voice our concerns to Super Padilla and Mendez and Hector. Talking to Anna Cruz and Medrano is a waste of our time. why when we finally get a great health plan and the local pharmacies are taking care of us does it have or need to change!!! this is wrong and they should be ashamed. There you go again just talking crap to discredit board members when in reality most have done much more harm than the insurance letter.. Yes the letter was written and so what, no harm nor money was exchanged or charged to the district. It was retracted and everyone was happy again and more than sure got their pockets lined. The bottom line it was probably unethical but not illegal for a board president to write a letter of such. This whole situation now will cost the district and employees more money. That’s a horrible move and the board should get exposed for it. This board has really lost the confidence of a lot people and we realize we made a huge mistake on who we voted for( Arnold, Leal, Medrano, Anna) members. Trust me is not going to happen again.. Arnold is the biggest disappointment because is more of a puppet than June ever was. Unfortunately our local economy will suffer with the insurance changes and if you don’t believe me ask your local pharmacist. They voiced their concerns and the board members turn the other way!! Good job coalition, keep up the great work!! NOT!!! Old maintenance worker you are correct. I had a long talk with Yliana when all that transpired and advised her that her decision to make a change of agent is totally unethical and the perception in our community was unfavorable. You learn by your mistakes, but I will say this about her, this Gal has Vision for SBCISD, and she is a successful educator. She is no raspa, like some of our other members. also, Old maintenance worker this blog is not about what happen in the past. I want to make sure that our board is working for the Kids, the Tax Payers. I Don’t know about you but I am keeping a close eye on Limon, and some of those board members and I hate to see when board members are being manipulated. Wake Up Bro. Your still at it whoever you are? You don’t understand insurance but you recommend no agent, interesting. Let me guess, hire a consultant to do all insurance dealings and leave it up to the staff to work the claims. The coalition can’t even get the superintendent situation correctly and you want no agent to fight for the best deal for us employees.. I’m sorry but it doesn’t make any sense to me. It’s very apparent our district is dysfunctional because of our weak super.. It all begins at the top with the super and the board must all be held accountable for the decisions made in our district. We have never had such a smooth and affordable insurance before SIG came into town and now the Super Arnold( the puppet for Oscar Medrano and Anna )want to bring in Bob Trevino.. I would expect this selfish move by Oscar and Ana never Padilla. All I can say is for the board to think about us employees first instead of themselves.. Surprised, we are talking about two different animals. I am taking about the major medical . If you think the managed health plan that costs 25 dollars a month and includes all sorts of benefits without copays is a good plan, you can thank a consultant for that not an agent. Working out your claims would be an agent but that is for voluntary insurance products. So thank the right people for your smooth affordable insurance plan, not SiG. Give me a break, here is a timeline . Yliana gets reelected and a few days letter has a letter written and she signed it changing agents, not insurance just changing agents. Her agent of preference was from SIG insurance. If the insurance was so bad why didn’t she go out for the whole insurance package? She was just concerned about the agent. You know that move blew up on her and she had to eat crow. She tried again later but one of her four didn’t vote with her so she had to eat crow again. I guess it tastes like chicken. So you talk about bringing shame to the family and under table deals? No Agent might be an option if our District was the size of a small Montessori school but you know thats not the case with our top notch school district. You need Agents that are qualified, know what the Hell they are doing and be service oriented. I hope you don’t want some guy from our community that has no true knowledge on health insurance and not being able to service the employees of our District. Hopefully Pete will bid. Regarding the high priced agents, please read the past blogs, our current agents saved the District $1.3 Million compared to the other high priced prior agents. Let’s just keep an eye Limon, and on the board members. If they can’t explain their actions, that means they are up to no good. Just like when they opened up the insurance with NO explanation. Again, you can’t have a chankla that has no job, dictating to weeker board members what to do. You got to be independent. One thing is certain. Theses clowns will be bringing so much shame to our District, and will be bringing shame to their own families. Just because of a possible under the table deals, what an embarrassment too their families Total ignorance. Once again best solution is no agent! That means even the current under table deals with current agent would end. Yes, I know I don’t understand how insurance works, but I can dream of a world without high priced agents. If we must have one give a local guy like Pete a chance. Of course they want to bring I their own insurance consult so they can recommend Bob Trevino Insurance. Typical ploy by Limon and the coalition to sneak in Bob’ worthless insurance plan and services..Arnold thinks his smart by striking these deals to get their way. We the people are starting to listen and observe every move these puppets are making and it’s not for the betterment of our district, employees nor students. I really hope if this mess continues TEA will recommend some type of action against these heartless, self centered and greedy board members.. Here we go again Boys and Girls. We currently have an Insurance Consultant on board at SBCISD. I understand Limon, and a couple of Chankla Board members are considering adding an additional Insurance Consultant ($$$$) by the name The Granados Group. Two other School districts in the West side of the RGV just hired that firm. Guess what, The Granados Group has very close ties with Bob Trevino / Jeff Everett. Guess what else, Limon might be able to squeeze them in if its under $50,000, before anyone in our District ever hears about it. Remember Granados = Bob Trevino / Jeff Everett. Here is a reminder our District could be heading toooo. Si Se Puede. You should have never be turned away at the clinic for any reason. I agree, but I did vote for this grupo. And they are so malo they are not working for the employees of this district and they only care about El Capitan Trevenio and his $$$$$$$$$$ shame on you Arnold and Angel……….El Cruza lead you around the by your nose….. Someone said the board must go. Guess what? They’re not going anywhere. These people were elected by voters of San Benito. This community is getting exactly what they voted for with these people. They had this game plan going for over a year before the elections. Just ask one of their relatives. They talk and talk. They are showing that they wanted a piece of the SBCISD pie, and they have it. Qualified and invested people of the community wanted to run for the board, but they listened to these people and stepped back. No one is suprised by any of these shananigins. It was all a matter of time.. Try less than 30 days. While we are at it, let us all sit back and see who they hire next. I have several friends that went to the clinic yesterday and the new carrier VB turned some of my friends that walked in, away. I also had some that had Saturday’s appointment canceled. You guys watch the insurance is next under Super Padillia’s watch…………….. I have been PERSONALLY turned away from the PREVIOUS clinic on more than TWO occasions. Sad! This will be the 100th post. The people have shared their concers about corruption, stability, integrity, political debts aka kick backs, scores, SB Board you do your job ethically, and make sure the super gets to work, and quit trying to do political favors. You all saw the video, no one has been indited BUT……. I understand, but we need to realize that we can’t expect a miracle in 2 months. Budget, insurance etc.. These are things that are going to take time to fix and by blaming each other it’s not going to work. We just need to pray for the best. It’s kinda hard to work with crooks, if you ask me. But maybe the Crooked Crew (ARNOLD, ANNA & OSCAR) can tell you different. In less than 2 months they’ve hit the road running and are definitely on the path to working together in fulfilling all those promises that were made during the most recent political campaigns (i.e., insurance, attorneys). Afterall, they’ve got a lot to lose if they don’t… $$$$$, especially Oscar who can’t even work. Someone’s gotta maintain his lifestyle…his BF alone can’t do it. As much as people have complained about Ylianna she is the only one to stand up for what is the right thing to do. For those who don’t know, and those who do know but don’t care. Ylianna simply wrote the letter because Bob Trevino was not doing his job.. The reason he wasn’t doing his job was in the past what was going to happen he had board majority for years and just flat got lazy. Board changed wanted better service for the employees and she wrote an agent of record letter. For those who don’t know this is done literally every day in Texas, and don’t take my word for it, ask any local agent you wish and I mean any. Her actions were backed up by the SBCISD administration when it was taken out to bid. They knew that the service wasn’t being done and it is all documented for those who wish to seek the truth, ask for the public records it is all there. Sig brought far superior service in and a person full time all day into the district twice a week to personally handle the employee’s. For that Ylianna gets crucified for a year and a half. The day she is gone the City of San Benito will have lost one of their biggest allies..
Well Yliana is a successful educator who brings a lot of know how to the District. , I would rather have her on board than some of those jobless chanclas we have now. If you mix some good educators and true business owners to the board you could have a good recipe for success. Instead we could have a super that has chosen to become political and has lost his vision for success for our children. What makes you think that Yliana and Fatima will be there next year? Maybe they must GO!!!! Really!!!! Damn people are ignorant! like you said. How funny, now with the new coalition and the downward spiral of our district, your recommending to be part of the solution.. Really!!!! Dam people are ignorant. Now it’s time to eat crow because we complained about the previous majority and now we got what we wanted.. We need to face the facts, and realize that these board members don’t have a voice and are basically puppets… Can’t wait for May 2015.. Anna Cruz must GO!!!! Mr. Or Mrs. Boss I do not work with USDA, I am not a fence rider. Yes, the past Majority may have had some issues based on your opinion, but there is no reason to continue that perception of the blind leading the blind. Bottom line when you have board members that have no job, no kids in the District that means we have people with no business common sense which leads to ignorant decision making. You get a reality check and then you get your head out of the sand, and start thinking outside of the box to finally realize what is really happening. Our current insurance carrier saved us $1.6 million for our district. Ignorant people cannot see the savings. Viola Luz: Don’t even go there with “we need to have transparency, integrity…” those friends of yours “the PAST MAJORITY” did all this mess by themselves. THEY HAD NO TRANSPARENCY>>>> don’t forget those so-called 60 allegations against the superintendent… AND THAT FAMOUS INSURANCE LETTER YRG wrote. Porfavor “Working Together” PLEASE get your head out of the sand….The fact to the matter BoB Trevino is still under investigation in one of our other School Districts in the Valley. Now Bob may not get the insurance bid, but it could be one of his partners. The, the bottom line we need to have transparency, integrity, and honesty in our District. Here’s the point. You can choose to be part of the problem, or part of the solution. You can choose to be influenced by the negativity around you. You can reflect the cautiousness and lack of confidence. You can contribute to that downward spiral in attitude. In this case, some of you have chosen to be part of the problem. Sounds like a broken record. Move on! Robin Hood! THANK YOU TAXPAYER their silence is deafining . I cannot believe the teachers are not more upset, but I guess when you speak up you lose your job!!!!!!! They will replace the managed care plan next….you watch, and that has allowed the employee’s the ability to have procedures done and receive treatment that never would have afforded………TICK TOCK people……. Without a doubt! The NEW MAJORITY has the best interest for the district, only as long as it involves their own pocket. Why else would they even consider Bob Trevino who could potentially be under investigation in neighboring districts? This new Board have definitely sold their soul to the devil and have no other choice BUT to pay their dues. Why is the district going out for bid? We are less than two months away from the start of school and we, the employees, are not even a thought in THIS BOARD’s thought process. Come on, board members! You are suppose to be for the kids and employees… well every thing you have shown in a little over a month, is that you are in it for yourselves. We your TRIPS and such. How very very sad! I had such HIGH HOPES for THESE Educated members. It makes no difference…. the employees should all attend the next meeting but we won’t for FEAR of LOSING our JOB. I’ll answer your question since apparently Bob Trevino supporters won’t answer. The reason for Arnold aka Board Super Hero, Medrano , Leal and Cruz taking all insurance products out to bid, is simple to try figure a way to repay BoB Trevino for supporting their campaigns.. It very obvious since there’s nothing wrong with our current agent and their wonderful service to our district. Furthermore, This is a great case of political retaliation and ” PAY TO PLAY” skim from the coalition. They don’t have our children nor employees as their priority, it’s all about their self gain and fulfilling their personal agenda..Horrible.. May 2015 election must replace Anna Cruz for sure!!! Come on no one can tell me the answer. How about you Rosalinda its always fun seeing how your brain works. How about a lucid reply from some body from the Trevino Camp that can explain all the mistakes that are documented with the insurance department? What is even more amazing is that Padilla and his gang would go out to bid and potentially change the insurance and benefit plans when enrolment is in August and the plans haven’t gone out to bid yet. So let me make very one aware if a change is made it will be done at the last minute, and the teacher will have it affect their lives and their students. It affects their students when they have to change their planning schedules at the last minute. The Contract was in the first year of a three year with no performance issues……….and why just one person……please tell me why is this being done to the employees and dependents. I guess all the board members had a great time at the San Antonio Conference. Let’s see what was in the menu, medium rare steaks, fancy wines, margaritas maybe it was a great time to negotiate a future job to board members who has no job. Speaking of people who have no job, hey board members don’t tolerate any arrogance from any of your colleagues who have no job, or a professional degree, or have no children in the district. Voice your opinion as you have your right too, and express you view how ever long it takes. OK gabby dig. Let’s look at the facts. SIG saved SBCISD over 1.6 million in premium. Now lets do your math. That saving can buy more score boards, sponsorships, FFA Donations, FYI I understand that SIG also made similar donations to the School systems (so what’s your point), Regarding showing proof, just Google the facts. Aside from your asinine comments our City also needs to improve the quality of businesses and infrastructure to help with Tax monies that could help our District. and improve the quality of our City. Our leaders have made this community a step child compared to our neighboring Cities. We are becoming a huge labor camp due to the inadequate lack of true leaders that have no vision for the City and the school district. In Cameron County We Vote for corruption and by golly we demand it. Remember it’s so obvious Our school leaders open up the insurance without looking at lose ratios, or looking at the renewal quote, and NOT explaining there reason for their actions. Mr Gabby you think that’s politically right? As long as you can supposedly buy your votes (aka Political Contributions) you can win an election. what’s important is our children, our community, our pride. How funny you have to seat there and justify why Bob Trevino should be our Insurance Carrier/Agent. I’m more than sure since SIG got the business they also have given money for scholarships on a few occasion, since they got awarded the business less than a year ago. But more importantly, they have also saved our staff $$$, as well as saving the district over 1 million dollars. You people are great to over look the facts, or I must say ignore the facts, just to give Bob the business for supporting the board members.. That’s called ” PAY TO PLAY”, ask the FBI, its also called CORRUPTION!!!! Da… You people sell your soul to the devil for money at the cost of the employees you guys are suppose to protect.. Sad.. When Bob Tumberlinson or whomever from that board were members, if they recommended someone, people criticized because they knew the persons. When Yliana recommened someone, people criticized. When Anna recommends someone, people criticize. it’s a big plus if Ana Cruz knows the person. And I believe they all know Dr. McShan also. Is Angel Mendez going to be criticized because he works at TSTC and Dr. McShan has ties to TSTC? Probably. I do have to say that the blogs/links do bring useful info for readers to follow up on and investigate, ask questions. Just like 3 years ago, someone placed articles on Donna ISD, and I followed up on links. Or the You Tube video with the former SB mayor and others being so rude at meeting with Sandra Tumberlinson. I firmly believe that the board owes it to SB Taxpayers to go out for bids on insurance. All this criticism, they might just keep SIG! When Bob Tumberlinson came on board, they kept the same attny from the previous majority board. Tonight is a great example of abuse of power without any type of explanation.to the community. This shows the Superintendent must think people are truly stupid and that we will not question their actions. Shame on all us if we accept this type of mediocrity. Regarding the jobless board members, come on guys you don’t have the power you think you have. Campaign contributions are legal. If this video proved that Bob Trevino was doing anything illegal, then why hasn’t been prosecuted? This video was clearly put together to make him look bad. Hearsay! Hearsay! Where’s the pudding? Show us real proof. You people are quick to jump to conclusions. Too too funny! I can agree that we must go through the correct process if we are going to look for a new insurance company, but to drag an innocent man through the mud because of a few campaign contributions is wrong. Remember that this man and his insurance company have sponsored many many SBCISD students and also our scoreboard. I believe he also gave scholarships. (Please correct me if I’m wrong) Lord, help this district! Unbelievable, our school district will run of out of money before AP and his coalition will be done with their term. Why do they have to continue to hire consultant after consultant? Let me help you, because their incapable of making objective, smart decisions, bottom line.. They approved to hire a firm to recommend a super but one of the firms if close friends with Anna Cruz( da conflict of interest) but don’t worry our wonderful Board president will allow it to go thru. Second, approved to hire another firm to evaluate health plan.. Seriously!!! Plus, all our insurance products out for bid after SIG saved the district over 1 Million dollars in less than 1 year. San Benito politics, total non sense and incompetence on our boards part when they can’t analyze and make educated decisions! Trust me people, the word is out that we have a totally worthless board and their going to get exposed pretty damn quick! There’s already flaws with their hiring of the valley baptist firm. But wait a Minute, Ap will try to cover that up too like everything else.. Their puppet master must be a total idiot.. If the shoe fits wear it… Where, O, where is TEA???? Please take over the board before we become Progreo, like!!!! Our eyes on you!!! So let’s see…Anna Cruz’s exboss is Dr. Alaniz who happens to represent the firm she so adamantly wanted to hire…I’d bet that Bob Trevino Insurance will submit an RFP since he is close friend’s to Oscar Medrano, contributed to his campaign, and then there’s Arnold who is being manipulated by what the other two convince him to do…Man up Arnold and learn to stand on your OWN two feet! And if you listen closely, i can almost hear the footsteps of TEA fast approaching. Brace yourself Mr. Limon cuz not even the man upstairs can bail you out of your troubles. Troubles that you have brought upon yourself! I have to agree with many I have been in opposition to: If that video is true, and Trevino is involved in corrupt practices in another district, our board would be wise to stay away from him. Even if our board is conducting business on the up and up, an alliance with Trevino, after viewing that video, is not a good career move for any of these board members. Like someone mentioned: We need to put our children first isn’t that why our school district is for,and not for personal gain. Personal gain was one of the first things some of the previous board members did. Hello! Sister being placed as the superintendents secretary didn’t she have 2 family members as board members, among others things. Where is the merit in that. So don’t talk about some of the other board members! This is just too funny! The way I see it some people just can’t handle defeat so they have to come up with mumbo jumbo to get attention. I’m sure the board is trying to work together but theirs always one that continues to feel that she can make a difference and another one that never says anything. WAH! WAH! WAH! Mr. Limon, I got one for you or maybe the board. Why are the meetings being held early at 6pm? This is very difficult for me to attend these meetings because I get out of work at 5pm. As a taxpayer, I’d like to be present at these meetings to know where my money is going but haven’t been able to attend the finance committee that was held last night and won’t be able to make it to tonight’s meeting due to the time constraint. I’d really like for you to consider the times of such meetings. How in gods name could anyone approve the debacle that is being looked at for approval, after the video above. and the consultant showed last night the employee’s of the district have saved 1,600.000 dollars in 9 months. who would vote to change that alone. sad sad day I bet the Taxpayers of this district would like to have a do-over.$$$$$$$$$$$$$$$ that’s why. And they ought to see La Joya. © 2019 San Benito News.